Hydropower stations, like all technology or infrastructure, won’t stay efficient, reliable or safe without regular and ongoing attention. Outages and failures caused by ageing or deteriorating infrastructure can be extremely expensive and serious, and far outweigh the costs of a well-targeted asset management plan. The costs of unreliability are even more significant for hydropower stations in isolated locations or where the power is relied on to run industrial or commercial operations. But asset management isn’t only about avoiding disasters … It’s also about getting the most out of asset life or ‘getting more bang for your buck’. Owners and operators stand to reap rewards from improved performance and greater reliability if they protect and extend the lives of their investments using best-practice asset management techniques. In today’s industry, significant amounts of time, energy and effort are invested in achieving desired plant performance at the lowest possible cost without exposing the business to unacceptable risk. Truly sustainable and successful businesses have found ways to balance these priorities, and have strategies in place to adjust the balance as needed when facing changing conditions. Besides the large financial consequences of outages, failures of systems and equipment can also place the lives of workers at risk. Repairing and upgrading equipment and systems only after they fail is an extremely costly and dangerous way to manage assets. This kind of basic ‘breakdown-oriented’ or reactive asset management is likely to result in unreliable plant and increased human and financial risks. As businesses mature in their approach to asset management, they progress from a breakdown-oriented approach, through reactive and corrective approaches, towards preventive, predictive and proactive approaches. Best-practice asset management focuses on reducing risks and improving condition and performance to get the best results. It is driven by strategy and responds to the market, empowers the workforce and makes workers accountable, and always puts safety first. It also needs to be flexible enough to accommodate the individual characteristics of different hydropower stations. Specialist power and water consulting firm Entura thoroughly understands the complexities and benefits of asset refurbishment, upgrade, modernisation and extension of life. As part of Hydro Tasmania, Australia’s largest renewable energy producer and water manager, Entura has day-to-day experience of the challenges of maintaining and upgrading assets to get the best performance, reliability and economy over the long term, through dealing with 30 hydropower stations built and maintained over the past 100 years. Entura’s asset management techniques are based on condition, performance and risk – designed to save companies time and money. This approach is underpinned by an optimised system that combines reliability-centred maintenance (RCM) and failure modes and effects analysis (FMEA) using generic failure mode databases that can be applied to various different assets with quick results. Entura’s asset management approach has helped other asset owners across Australia, New Zealand, Papua New Guinea and Malaysia to reduce their costs, reverse declining reliability, obtain better returns through increased performance and improved technology, increase personnel safety, decrease fire and flooding risk and other hazards, increase skills of their staff, and ensure the long-term viability of their valuable infrastructure. Entura’s approach to best-practice asset management has three steps that fully consider your assets’ past, improve their present operation and risk profile, and position them for their best possible futures. remaining useful life (an estimate of the rate of deterioration of the asset, indicating where the particular asset is on its lifecycle curve, and whether a refurbishment or upgrade can improve its position on this curve, even effectively returning it to as-new condition). We present a high-level ‘water-to-wire’ summary of the condition and performance assessment results that quickly and graphically displays the known asset condition and remaining useful life, and identifies components for which the condition is not adequately known. Once an asset has been fully assessed, we develop a risk and mitigation plan. First, we gather and review a comprehensive set of information on the operation, design and construction of the station and its assets. We explore both the asset history and generic databases to determine probable failure modes. Once we’ve gathered this information and analysed it against the requirements of the power station, we report the known condition of the plant in terms of business risk and develop practical and cost-effective mitigation strategies to reduce risk to a level that is both achievable and acceptable for the business. 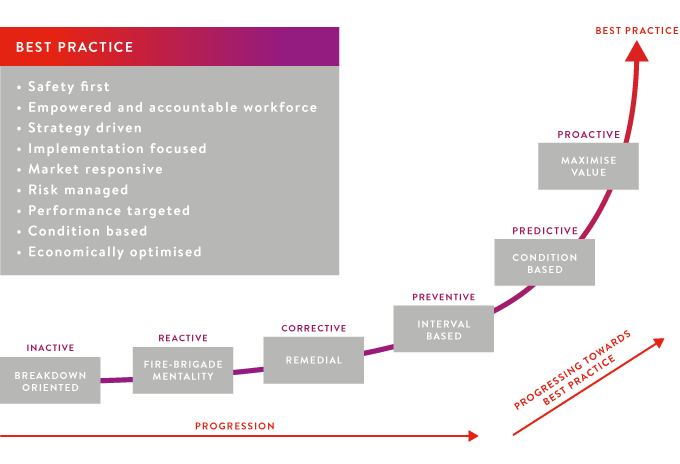 We identify and undertake mitigation actions including ‘quick wins’ (actions that can be undertaken quickly and easily to achieve major improvements) and immediate priority activities to reduce risks. We also detect assets or components that need further investigation. Best-practice asset management takes a broad view of the life and operation of an asset, not only reducing immediate risks, but also promoting long-term efficient performance and sustainability. Our approach optimises the capital and operational costs over the remaining life of the asset. A valued part of Entura’s asset management approach is our ability to offer a review of likely efficiency and capacity gains, and other general suggestions for improving performance and systems. An important step in our holistic approach to achieving long-term safety, reliability and efficiency is training local hydro operators to fill any identified skill gaps and better safeguard the maintenance of assets. We build the capacity of our clients through on-site or formalised training through our Entura clean energy and water institute. If you would like to discuss how Entura can assist you with assessing your hydropower plants or other power or water assets to minimise risk and maximise efficiency and useful life, please contact Ambrose Canning on +61 3 6245 4212 or James Mason on +61 3 6245 4196. Ambrose Canning is Entura’s Principal Consultant, Mechanical Engineering. He has more than 30 years’ experience working on hydropower and water infrastructure projects in Australia, New Zealand, Malaysia, Papua New Guinea, India, Nepal, Philippines and Indonesia. He specialises in all aspects of hydropower development and redevelopment, upgrade and rehabilitation. He also has expertise in aspects of water infrastructure, such as dam electro-mechanical and hydro-mechanical equipment, pipelines, valves, pumps, screens, gates, valves and bulkheads.